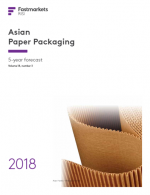 Asian Paper Packaging Forecast - 5-Year - Fastmarkets RISI - Objective Insight. Better Decisions. A comprehensive assessment of the Asian paper packaging market, including selected prices and costs for containerboard, boxboard, packaging and industrial papers, wood pulp, nonwood pulp, recovered paper and pulpwood.